The sun is the reigning lord of our solar system. It is our leader. All the planets including ours, follow it faithfully through space. It is the central intelligence which seeks its expression through its orbiting subjects. The sun gives us the ability to see and gives us the energy to unfold our vision, through its greater vision. 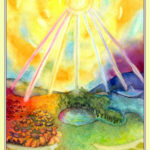 The sun streams its rays in all directions bringing light, color and information into the dreaming mind of the earth. It soaks her soil with warmth and causes the slumbering seeds to stir and reach upwards and realize their potential. Its golden rays are like trumpets announcing the morning. The call of the sun is “wake up, wake up! Become who you are and in the process of becoming who you are, you will become more than you ever imagined. Come out, open up and unfurl the brilliant colors of your soul. You will never know them until you become, so start now, be bold, dare, the day is only so long”. You can sleep walk throughout the day, or blast through it full force and create a huge impact. The sun will shine and shine equally regardless. The sun is our personal star. It is there to cheer you on and tell you that you can do it. It believes in you and it is there to bring light, clear doubts and give you courage to perform. 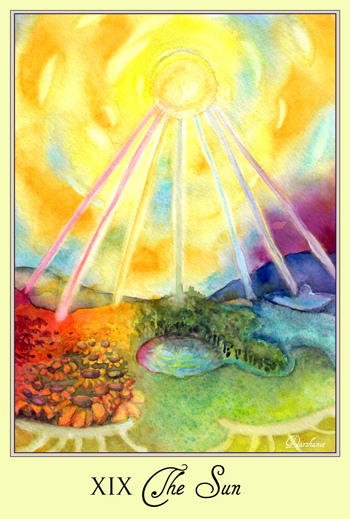 When you get the sun card it is time to tap into your creativity. Feel the power within you and express it. You are original and your expression is most glorious when it is shining without filters, like a clear blue sky. Embrace light, embrace color, embrace your creativity and shine. This entry was posted in Major Arcana, Tarot on August 6, 2016 by darshanie.